We can not state an exact date when answering the question concerning the establishment of the Byzantine rite. Church, established by Jesus Christ, was spread across the world after the descent of Holy Spirit. Since first centuries certain differences concerning religious celebrations start to appear, naturally, influenced by local culture and mentality of nations. There was a significant influence by the synagogical worship in Palestine, where the majority of Christians originate from Jewry. There was a difference between Romans, rather strict and pragmatic, and Greeks who had greater sense of theatricality and pomposity. There was a different situation in Syria, and different in Egypt. These differences in culture and mentality had naturally occurred in spirituality and in a form of worshipping. After Milanese Edict (313) the differences and contrasts began to crystallise and the individual rites began to differentiate. Our Byzantine rite has its roots in the Greek part of Empire, the influence from Palestine and Antioch is significant too. In 9th – 11th centuries was the Byzantine rite adopted by Slavic nations, which influenced and enriched its form, that is the main reason for referring to it as to a Byzantine-Slavonic rite, which is slightly different from the Byzantine-Greek or the Byzantine-Melchite rite and spirituality. The attendance of the Byzantine Catholic Church in Slovakia derives from the activities of two Slavic saints: Saint Cyrill and Saint Methodius who introduced Christianity to the region. 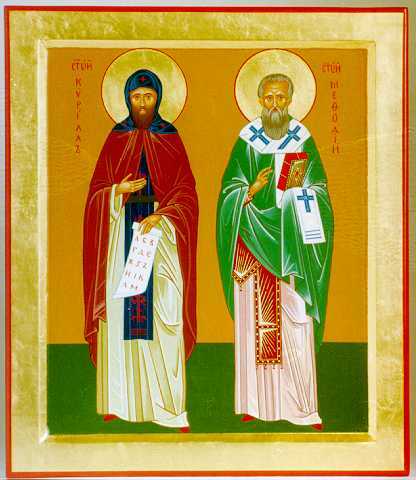 “Saint brothers” from Thessaloniki brought to Great Morava Christianity and consequently the Byzantine rite too. Together with the translation of the Bible they prepared the translation of the Liturgy and other worships into clear and comprehensible language, as it is usual in the East. After the death of Saint Methodius and after the banishment of their disciples in 885 the Byzantine rite was restrained and gradually vanishing but it has never completely vanished from our territory. Even during the reign of Dynasty of Arpad (11th - 12th centuries) in Hungarian Empire many Byzantine monasteries were established. Pope Inocent III had shown the willingness to establish the bishopric even of the Byzantine rite. The opposition of the Latin (western) clergy and the historical circumstances changed the situation and it gave the main reason for rough period of latinization (e.g. prohibition of building Byzantine churches in towns, the vicars of the Byzantine rite on the mixed areas were subordinated to a western bishop...) The reinforcement for a small community of the Byzantine rite was Walachian colonisation from 14th century, which signified a great influx of Christians of the Byzantine rite. Since 15th century there are reliable reports about the existence of the Eparchy of Mucachevo occupying our area up to the area of Spis. It is objectionable to observe the unity or disunity of Eastern Christians with the Catholic Church in 11th - 17th centuries, anyway, the considerable part was not united. After many ‘tries’ they claimed the Unity with the Catholic Church in 1646 by ratifying the Agreement of Unification in Uzhorod. The component part of this Agreement was a promise not to interfere in the worshipping or spiritual life of Eastern Christians and not to force them to adopt their habits and forms of spirituality or any attempt of assimilation by Latin Church. In spite of that, a hundred years later we notice an evident pressure of assimilation. Later on this attempt of assimilation is noticeable within the Byzantine Catholic Church. There were many causes of it. Byzantine priests were not equal coram state with Latin priests. They were usually, with a few exceptions, serfs and they were not supported by the state. This situation lasted until 1692 when the emperor Leopold I. granted equal rights for the Latin as well as for the Byzantine clergy. Byzantine Catholic priests acquired their higher theological qualifications at Roman Catholic Universities (e.g. in Trnava). The superiority of the Latin rite was strongly noticeable in whole Catholic Church, especially after the Lateran Concile IV. Many Byzantine Catholics viewed the Latin rite as something ‘superior’ and that fact caused a rapid adaptation of various Latin items (e.g. adoration of the Eucharist, cross way) and the Latin way of spiritual life and thinking. The aspirations of the Latin bishops to subdue Eastern Catholics, latinization and hungarization of Eastern Catholics culminated in 18th century. Pope Clement XIV officially established the Eparchy of Mucachevo on 19th September 1771 thanks to Maria Theresa. It consisted of 711 parishes and 560 thousand worshippers directly subordinated to Rome. In the intention to facilitate the administration of that large territory the Vicary of Kosice was established in 1787. (Later transferred to Presov ). The emperor Frantisek I decreed to establish an independent Eparchy in 1816 (1815). Vatican officially confirmed it on 22nd September 1818. The territory of middle and south Zemplin remained under the administration of the Eparchy of Mucachevo. (De facto until 1939, the establishment of the Apostolic Exarchate in Kosice legally solved that affair). Byzantine Catholics – Ruthenians and Slovaks – had to resist intense Hungarian pressure. The national issues concerning Ruthenians occurred during the whole period of the existence of the first Czecho-Slovak Republic. 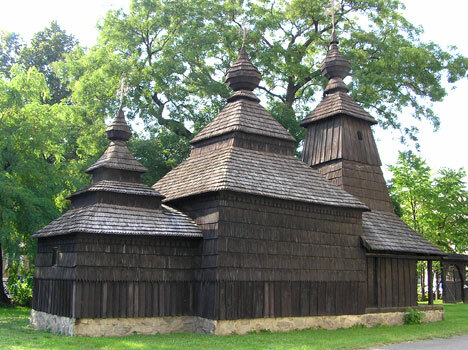 One of the Byzatine Catholic wooden churches in Slovakia (from Kozuchovce). 28th April 1950 is an another significant point in the history of the Byzantine Catholics in Slovakia. It was a day when so-called Sobor of Presov obliterated the Byzantine Catholic Church. Bishops Paul Gojdic, OSBM and Vasil Hopko were together with many other priests imprisoned, the rest of them became members of the ‘Schismatical’ Orthodox Church, or were forced to leave. Worshippers were forced to accept the separation from Rome, whereupon they could keep their Byzantine rite, or they could attend the mass in Roman Catholic churches. More then 123 priests died during the period of 18 years of “non-existence” of the Byzantine Catholic Church. “Spring of Prague” 1968 gave the opportunity for the restoration of the original condition, but the invasion of the troops from the USSR and four other Warsaw Pact countries ruined every hope. The Byzantine Catholic Church was officially acknowledged, but the reversion of the property was not realized in full extent and the persecution carried out by the public authority caused the obstruction of its development. Clergy could be formed only in the Roman Catholic seminary, the only one existing in Slovakia. Worshippers got used to the western environment and very often only with great difficulties turned back to their original rite, spirituality and habits. After the change of political rates in 1989 – 1990 the full rehabilitation of the Byzantine Catholic Church could be finally completed and all its activities were about to develop in all conceivable dimensions. The function of the priest seminary and the theological faculty was renewed and many church schools were founded. There is an attempt, particularly among younger generation, to renovate the rite and spirituality (to clear it from latinization), an attempt to return to the original and traditional treasures of our Church. An expressive stimulus towards this renovation has been given by the II. Vatican Council and recently also by John Paul II’s apostolic letter – Orientale Lumen (Light from the East). After the foundation of the Apostolic Exarchate in Kosice there are also great expectations of founding another Byzantine Catholic see and eventually the founding of an independent archeparchy of the Byzantine Catholic Church in Slovakia.